PYONGYANG, North Korea — The leaders of North and South Korea announced a wide range of agreements Wednesday which they said were a major step toward peace on the Korean Peninsula, but with a big condition for denuclearization. 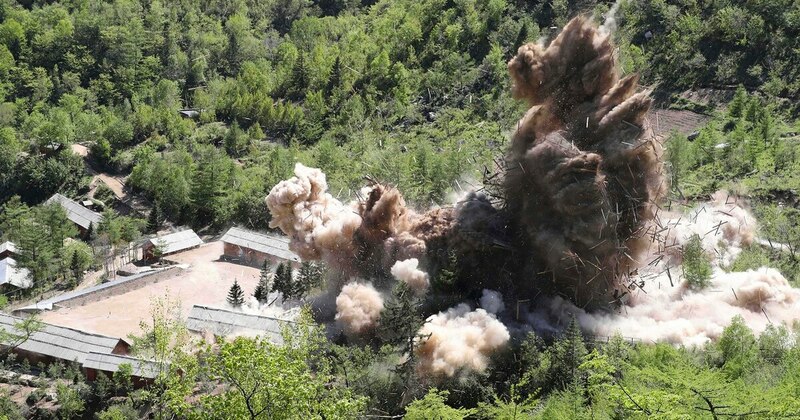 North Korean leader Kim Jong Un stated he would permanently dismantle his main nuclear complex only if the United States takes corresponding measures. Kim and South Korean President Moon Jae-in agreed in their second day of meetings to an ambitious program meant to tackle soaring tensions last year that had many fearing war as the North tested a string of increasingly powerful weapons. Their agreements include more buffer zones to reduce tensions, and a no-fly zone above the military demarcation line that bisects the two Koreas. Kim promised to accept international inspectors to monitor the closing of a key missile test site and launch pad and to visit Seoul soon. The question is whether it will be enough for U.S. President Donald Trump to pick up where Moon has left off. Trump told reporters Wednesday “we’re making tremendous progress” with North Korea and “we had very good news” out of the summit. The news from the summit brought a quick and negative response from Republican Sen. Lindsey Graham, who tweeted that he was concerned the visit would undermine efforts by Secretary of State Mike Pompeo and U.N. Ambassador Nikki Haley to impose “maximum pressure” on the North. I’m concerned South Korea’s visit is going to undermine efforts by @SecPompeo and Ambassador @nikkihaley to impose maximum pressure on the North Korean regime. North Korea has been demanding a declaration formally ending the Korean War, which was stopped in 1953 by a cease-fire, but neither leader mentioned it Wednesday as they read the joint statement. Moon and Kim made what appear to be concrete moves to reduce tensions on their border. According to a statement signed by the countries' defense chiefs, the two Koreas agreed to establish buffer zones along their land and sea borders to reduce military tensions and prevent accidental clashes. 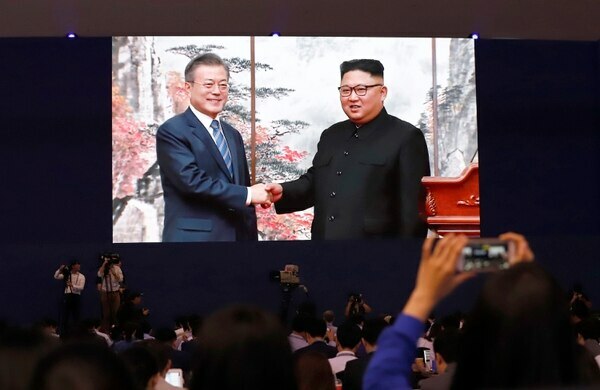 They also agreed to withdraw 11 guard posts from the Demilitarized Zone by December and to establish a no-fly zone above the military demarcation line that bisects the two Koreas that will apply to planes, helicopters and drones. The two Koreas eventually aim to withdraw all guard posts, where combat troops are stationed. They also decided to launch their first-ever joint searches for soldiers killed during the Korean War next April at a DMZ area where one of the fiercest battles happened. Here's how you can tell Americans from others, experts say, and other mysteries DNA can solve. 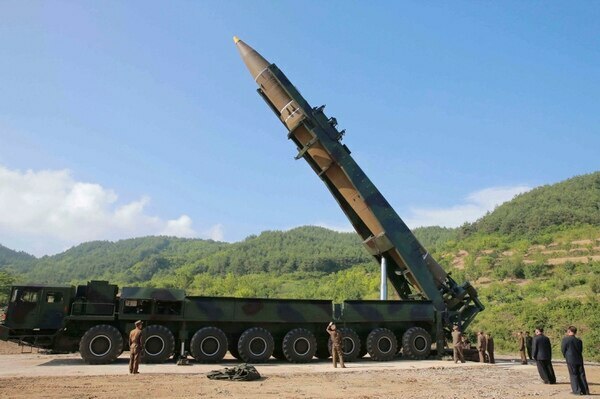 The Koreas would stop live-fire and field maneuver exercises in the areas 5 kilometers (3.1 miles) from the military demarcation line and in waters close to the maritime boundary. The countries also would put covers on coastal-based artillery guns. They agreed to “disarm” their jointly controlled area at the border village of Panmunjom, the site of the past two Kim-Moon summits. It’s also where North Korean soldiers sprayed bullets at a colleague fleeing to the South last November. According to Seoul documents, the Koreas would pull back weapons and guard posts in the area to let 35 “unarmed personnel” from each side guard the village and let tourists freely cross concrete slabs forming the demarcation line there. Denuclearization: What would that mean? The move wouldn't be entirely meaningless if Washington and Seoul could successfully argue that, in allowing outside experts, Kim accepted in principle that agreements should be verified. This could make it harder for Kim to reject inspections once the denuclearization process proceeds. The North unilaterally dismantled a nuclear testing ground earlier this year, but didn’t invite experts to observe the event. Still, the discussions on the North’s denuclearization continue to fail to answer the basic questions of what, when and how. The North for decades has been pushing a concept of denuclearization that bears no resemblance to the American definition, vowing to pursue nuclear development until the U.S. removes its troops from South Korea and the nuclear umbrella defending South Korea and Japan. Some experts say that Washington is trying to shape the nuclear talks as a bilateral arms reduction negotiation between two nuclear states, instead of a process to surrender the North’s nukes. For many South Koreans, it would be mind-boggling that the Koreas are even talking about sharing the Olympics. North Korea boycotted the 1986 Asian Games and the ’88 Summer Olympics, both held in Seoul, and relations dramatically worsened on the eve of the Seoul Olympics with the North’s bombing of a South Korean passenger jet that killed all 115 aboard in December 1987. Associated Press writers Hyung-jin Kim and Kim Tong-hyung in Seoul contributed to this report. Talmadge is the AP’s Pyongyang bureau chief.